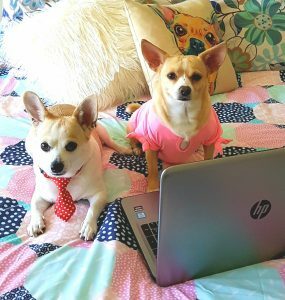 These two adorable fur babies are the inspiration for their mum Genevieve to launch Gemma and Ollie – a store where you will find a range of gifts for your precious fur babies. We believe in personalised service, quality and integrity. Gemma and Ollie love fashion and enjoy a fun and pampered lifestyle. All our products have their pawprint of approval. We are passionate about our Health & Wellness range. Our Aromatherapy Paw Balm was developed initially as Gemma’s paw pads were becoming rough and I wanted a natural product to use on her. Ollie was the reason I added the lavender essential oil as he has epilepsy and anxiety and the lavender works to help calm him. For more of Gemma and Ollie’s adventures, click here to follow them on Instagram. Gemma and Ollie are proud to be linked with the following affiliates and friends of the company.